In the midst of the Caribbean just below Cuba are the wonderful Cayman Islands. The largest of the islands, Grand Cayman, is a popular tourist destination offering visitors the best in beautiful beaches, gift shopping, and water activities. The elegantly designed Plantation Village Beach Resort is located on the famous Seven Mile Beach, known for its surfing, snorkeling, and water sports. This resort features fabulously appointed villa-style guest suites overlooking the waterfront and surrounded by lush gardens and manicured lawns. 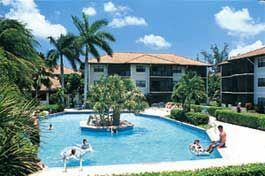 The Grand Cayman timeshare resales available at Plantation Village Beach Resort offer vacationers a terrific chance at an affordable vacation, with discounts only available by buying from an existing owner on the resale market. For the best of what the Caribbean has to offer, it's hard to beat Plantation Village. The villa-style timeshare suites at Plantation Village Beach Resort are located in three-story stack buildings that overlook the beachfront. The suites are two- and three-bedroom and feature a master bedroom with a king or queen bed, additional bedrooms with multiple twins or double beds, and separate living and dining areas. The sizes range from 1,000-1,500 square feet. All timeshares have a private balcony terrace overlooking the ocean. The living rooms are furnished with a large sofa, soft chairs, and large-screen TV. The kitchens contain a stove and range, refrigerator, and breakfast nook. All of the villas have high-speed Internet access. On the property are lighted sports courts, a kids playground, and a modern outdoor BBQ area. There are two outdoor pools, a bike rental station, and a kayak rental station. Owners enjoy free kayak and bike rental, and maid service is available seven days a week. Grocery stores are located within a mile of the resort, and several fine-dining restaurants are within walking distance. Sailing rental outlets are also located near the resort. Several golf courses are within a few miles of the resort complex. The Cayman Islands are known for the friendly hospitality of the locals, and guests at the Plantation Village Beach Resort will quickly fall in love with the island culture. Gift shopping in the town, exploring the island by bike or tour bus, and taking in the local nightlife are popular activities for guests. These Grand Cayman timeshare resales make this resort one of the most affordable vacation experiences imaginable. Contact Plantation Village Beach Resort Specialist Today!